If you come to visit our house, I apologize in advance that you will typically not find soda here. We only buy it for birthday parties and when we know we are having dinner guests that drink it. The boys, TechyDad included, do not like carbonated beverages. I do, but not that often. When visiting Disney World, I have been known to have a Sprite or another decaffeinated soda of choice. NHL loves water, milk and from time to time vegetable juices. The little guy could live on water alone. TechyDad and I drink 64+ ounces of water in our Nalgene bottles daily and rarely have anything else. From time to time, I do crave something different like a sugar free peach ice tea or lemonade. I have tried flavored waters, but often found them to be too sweet for me. 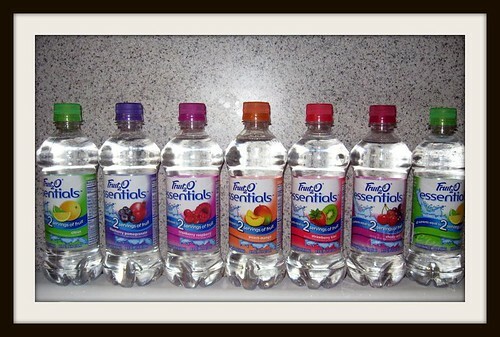 Recently, I was asked by Sunny Delight Beverage, Co (via Mom Select) to try the new Fruit2O Essentials. They mentioned a wide variety of flavors that sounded interesting, so I said yes. From the creators of Fruit2O®, the original fruit flavored water, comes a new fortified water unlike any other – Fruit2O® Essentials™ – providing nutrients found in two servings of fruit with zero calories in each bottle. "Studies have shown that 80 percent of Americans do not drink the recommended eight glasses of water a day, and as much as 77 percent of Americans do not eat the recommended servings of fruit a day,” said Tammy and Elysee Lakatos (The Nutrition Twins) certified trainers and nutritionists. “More than any other consumer group, women have expressed a particular desire to be healthy and consume the recommended daily intake of fruits and water. But with an increasingly hectic lifestyle, many find it difficult to incorporate these important elements of nutrition into their daily diet." Fruit2O Essentials was created with that in mind. Every bottle provides nutrients found in two servings of fruit, including important vitamins and minerals and one gram of fiber. Each of the six delicious flavors combines a popular fruit with a super fruit delivering uniquely beneficial nutrients. Unlike many other fortified waters in the category, Fruit2O Essentials has a subtle fruit flavor, zero sugar, zero calories and only one gram of carbohydrates. It is a great tasting way to help women achieve the appropriate level of hydration to keep them looking and feeling healthy. And, most importantly, the nutrients and benefits are as clear and easy to understand as the benefits of drinking water and eating fruit, making it simple for women to incorporate this drink into their life and diet. Only available in US markets at this time. Grocery stores sell single bottle at $1.00 to $1.19. Club Stores sell 15 packs at $8.99 to $10.99. Fruit2O also has a Facebook page. You can "Like" them to receive product information, new fitness videos, tips, coupons and special events in your area. Fruit2O has also partnered with the American Diabetes Association (ADA) to help women to make small changes that create lifelong health improvements. Fruit2O will be on tour this summer sharing information about Small Changes, Lifelong Results campaign and partnership with the ADA. Starting this Friday, May 14, visit online to make a pledge. If you do, $1 will be donated to your local ADA chapter to help fight diabetes. More updates are available on the Facebook page. Our samples of Fruit2O Essentials arrived during Passover, so I put them aside to have after we were finished with the holiday. When we were done switching things out, I placed the seven bottles (one of each flavor listed above and an extra Citrus) into our refrigerator to chill. One thing I have noticed is that flavored water typically tastes better when very cold. The first one that we tried was the Citrus flavor. Let me preface this with a little information. When we go to restaurants and I am served water with lemon in it, I will ask for a new water with no fruit inside. I am not a fan of lemon in my water, yet I do like lemonade. When I took a sip, I was not too sure how I felt. I allowed my very eager six year old son, NHL, to try some. He loved it and begged for more. I tried a little more and handed over the bottle to NHL. He quickly drank it and asked if we had more. I told him we would try another flavor the next day. I think the reason I was not a fan of this flavor was because it was too similar to lemons in water and I seriously do not like that. Our favorite flavor was the Peach Mango. I saved this until later because I was most intrigued by the combination. I love peach ice tea, and anything with the fruits sounds delicious. I was pleasantly surprised. There was a definite peach/mango flavor that was not overwhelming. Since I rarely drink anything other than plain water, I was sensitive to another taste – which was in all of the drinks. From process of elimination, I believe it was the sodium. Yes, apparently my taste buds are that sharp since we do low salt meals here! NHL and JSL both adored this one. As you will see below, we all shared and finished this flavor together. 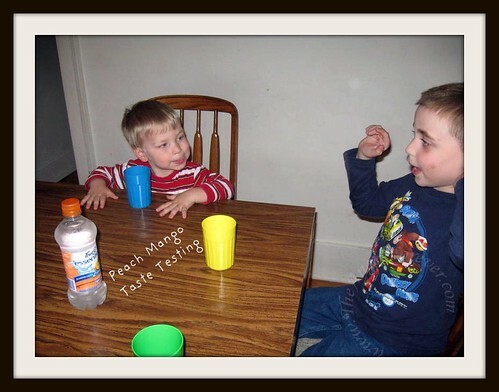 Overall, the boys really liked the Fruit2O Essentials drinks. NHL keeps asking if we have more for a special treat. As I stated at the start, I am a plain water kind of girl. If I was really hot and out in the sun, I think I would have appreciated these drinks a little more (will try again this summer when we head to Six Flags for the day). 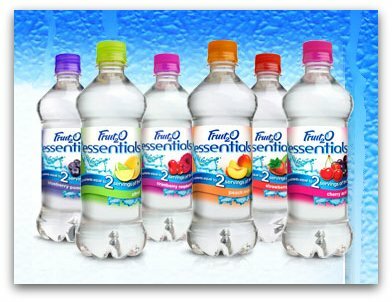 People that like flavored water will probably enjoy Fruit2O Essentials since the flavors are present, not too strong and they are packed with a lot of extras in the line of vitamins and more. Thanks to MomSelect and Sunny Delight Beverage Co., one lucky reader will win variety pack of Fruit2O Essentials to try for yourself. Below are the bottles that I received for review. MAIN RULE – Answer the following question: What small change are you making to live a healthier life? For all bonus entries below, please be sure to leave a separate comment for each extra chance you are allowed. Bonus Entry – What flavor of Fruit2O Essentials are you most interested in trying and why? 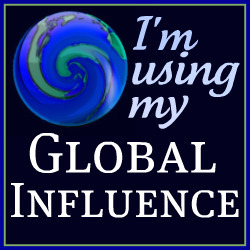 1 Bonus Entry – Leave a comment on any of my non-giveaway posts from the month of April/May. Be sure to leave a comment here to let me know which one. This Bonus entry may be done only twice per person. To enter, please follow the rules above within the comment section. Contest starts today May 11 and ends at 10:59 EST on May 25, 2010. You do not have to be a blogger to enter, but must leave a valid e-mail address for me to contact you for mailing address once the giveaway is over. I will select the winner using random.org and contact you via e-mail. You will have 48 hours to claim the prize. If there is no response, another winner will be selected. Open to U.S. residents only. 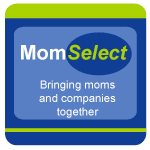 Disclosure: This review and giveaway was made possible by MomSelect and Fruit2O Essentials. They provided me with the product samples to facilitate this review. The opinions of this review were mine and I received no other compensation. The Blueberry Pomegranate is most interesting to me since I have smoothies in that flavor from WW and like to mix them with water and thing the Fruit2O would be a good mix-in. I have cut back to just one small snack a day, and it’s always fruit! Just yesterday I cut a fresh pineapple. Yum Yum! We’ve begun cutting high fructose corn syrup from our family’s diet. I was surprised to find it in so many things. Even our ketchup! I think the Blueberry Pomegranate would be a big hit with our boys. They like blueberries in everything! .-= Teresa´s last blog ..Homemade Simple Coupon Booklets =-. We’re trying to drink more water and less soda. I can’t wait to try the Cranberry Raspberry flavor. I’m trying to eat healthier…less fat and cholesterol in my diet. Also more exercise, usually a walk. My selected flavor would probably be Cranberry Raspberry. I like anything raspberry, my favorite! blueberry pomegranate sounds great. I haven’t seen that one on the shelfs anywhere. I’ve cut most caffiene out of my diet. I’m most interested in trying the Cherry Acai because I love cherry flavored drinks and candy. I have started a weightloss journey (Jan 10) and lost 30lbs, drinking water is a must! I would love to try the Cranberry , that one looks delicious! I’m cutting down severely on my soda and iced tea consumption and increasing my water intake considerably. Thanks to everyone that entered the giveaway. The comments are now closed and the winner will receive an e-mail very soon.